One of the main arguments used to advocate in favor of the current model of closed borders is known as priority of compatriots. According to this argument, a state would be entitled to control and limit the entry of foreigners into its territory because otherwise it could not maintain the socioeconomic system that allows to devote special attention to the needs of its less advantaged members. If it were not true that opening would undermine rich countries’ redistributive efforts and their schemes of social and economic justice, such an argument would no longer make sense. Yet, criticism to the priority of compatriots as justification for the closure of borders does not have to rest on the empirical level. Without denying the practical conflict between patriotic loyalties and global distributive responsibilities, I develop a critique to this argument analyzing whether these are strong enough to withstand the weight of the intrinsic value of all human beings and their most basic and urgent needs. Van Parijs, Philippe, Yanick Vanderborght. 2010. Basic income, globalization and migration. In Sustainable Utopia and basic income in a Global Era pages. Seoul: Seoul National University. 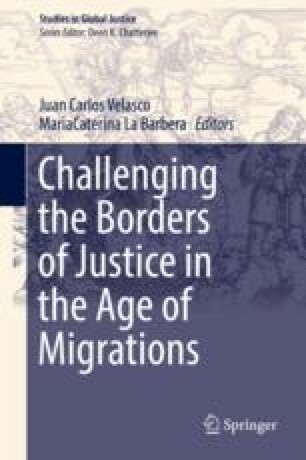 Available at: https://www.uclouvain.be/cps/ucl/doc/etes/documents/2010.BIGlobalizationMigrationdraft4.pdf.